My second morning in Korea, I went to a friend's house for breakfast. 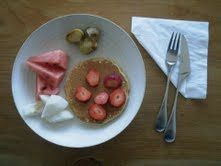 Here is what we ate: buckwheat pancakes (no syrup needed), fresh fruit (watermelon, apple-pear and strawberries atop the cake), roasted sweet potato (skin removed) and a cup of strong coffee (no milk). Freshly squeezed apple-tomato juice (better than I expected) preceded the meal. Don’t you just love how the food is composed on the plate? I also admire the artful napkin folding and its adjustment of the basic, square geometry. This is what happens when an architect and his equally creative wife translate their talents to the kitchen. I am certain that the food tasted even better because of the beautiful setting. Buffeted by lovely, spring cross breezes, we sat at a magnificent wood table (also designed by the architect) running the length of the dinning room. This skinny space is sandwiched between a picture window framing a fabulous view of the valley below and floor-to-ceiling glass opening on to the house’s interior courtyard. The unusually crisp light coupled with the fresh air was practically Californian. The product of a Korean studio potter, the dishes influenced my taste buds as well. Perfectly round with a raised edge, the matte-finished plates were the ideal backdrop for the colorful foods. Maybe this is why Brad Pitt bought them. And the coffee cup, slightly over sized but thin-lipped, sat elegantly on its wooden saucer. The muted blue glaze reminded me of a watercolor painting. If the eye is happy, then the stomach may follow. How's the Asparagus n o w ?? ?